Extracorporeal exposure of peripheral blood mononuclear cells to the photosensitizing compound 8-methoxypsoralen and ultraviolet A radiation has been shown to be effective in the treatment of several T cell mediated diseases including cutaneous T-cell lymphoma and rejection after organ transplantation. We present 21 patients (10 male, 11 female) with hematological malignancies with a median age of 36 (range: 25 to 55) years who had received marrow grafts from sibling (n=12) or unrelated (n=9) donors. Six patients had acute graft versus host disease (GVHD) grade II to III not responding to cyclosporine A (CSA) and prednisolone when referred to extracorporeal photoimmunotherapy (ECP, Photopheresis). 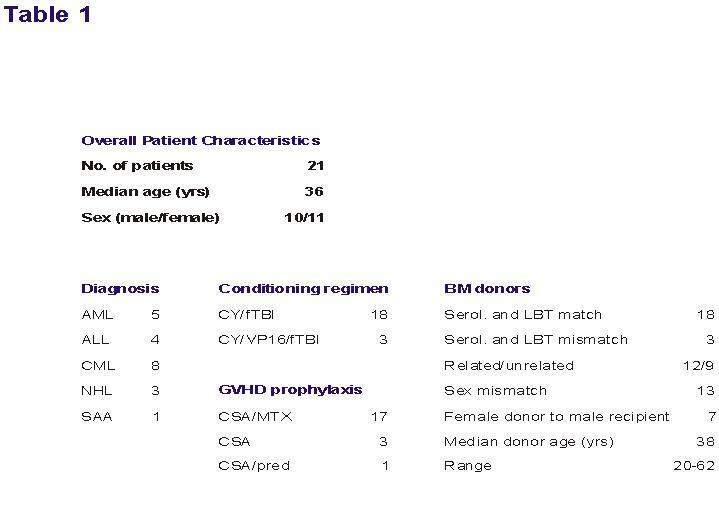 In 15 patients 2 to 24 months after bone marrow transplantation (BMT) extensive chronic GVHD with involvement of the skin (n=15), liver (n=10), oral mucosa (n=11), ocular glands (n=6), and thrombocytopenia (n=3) developed and was unresponsive to conventional therapy including steroids. All patients were treated with ECP on 2 consecutive days every 2 weeks for the first 3 months and thereafter every 4 weeks until resolution of GVHD. ECP was tolerated excellently without any significant side effects. Following a median of 14 cycles of ECP, acute GVHD resolved completely in 4 of 6 patients (67%) and partially in another 2 patients. Cutaneous chronic GVHD completely resolved in 12 to 15 patients (80%). 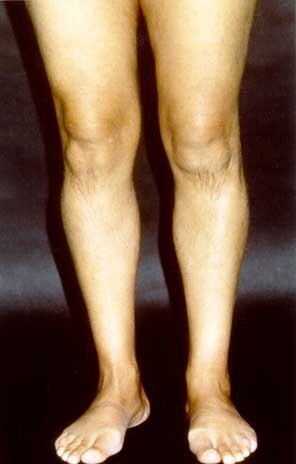 Contractures of knees and elbows due to scleroderma resolved partially. Oral mucosal ulcerations resolved in all patients. Seven of 10 patients (70%) with liver involvement had complete responses after ECP. After discontinuation of ECP no severe infections were observed. Our findings suggest that ECP is a safe and effective adjunct therapy for both acute and extensive chronic GVHD with skin and visceral involvement with resistance to conventional therapy. Despite improvements in post-transplant immunosuppression, up to 30% of HLA-identical marrow graft recipients and up to 90% of patients given marrow from unrelated donors still develop significant acute graft-versus-host disease (GVHD). Prednisolone has been shown to be effective in the treatment of established acute GVHD. 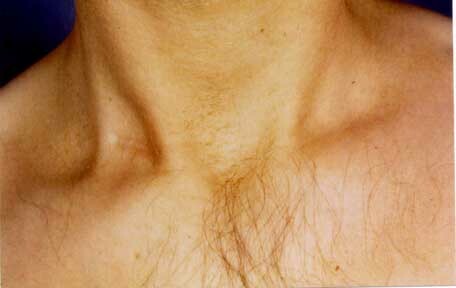 However, patients not responding to corticosteroids are at high risk of death due to infections. Chronic GVHD affects 50% of long-term marrow transplant survivors, and is lethal in 20% to 40% of affected patients despite aggressive treatment. Primary therapy for extensive chronic GVHD includes corticosterolds and cyclosporine A (CSA). Other therapeutic options are thalidomide, azathioprine, psoralen and ultraviolet A (PUVA) and monoclonal antibodies. However, these therapies are often unsuccessful in patients with extensive multiorgan involvement and are associated with significant therapy-related complications. Considering the toxicity and incomplete response rates of conventional treatment for chronic GVHD, alternative approaches are needed for patients who do not respond to firstline therapy. Extracorporeal photoimmunotherapy (ECP, Photopheresis) is currently being used for the treatment of cutaneous T-cell lymphoma, selected autoimmune diseases and rejection after organ Transplantation. ECP consists of infusion of UV-A irradiated autologous peripheral blood mononuclear cells collected by apheresis and incubated with 8-methoxypsoralen (8-MOP). Recently, ECP has been used in the treatment of severe GVHD. Here, we present our experience in patients with extensive chronic and steroid-refractory severe acute GVHD treated with ECP. 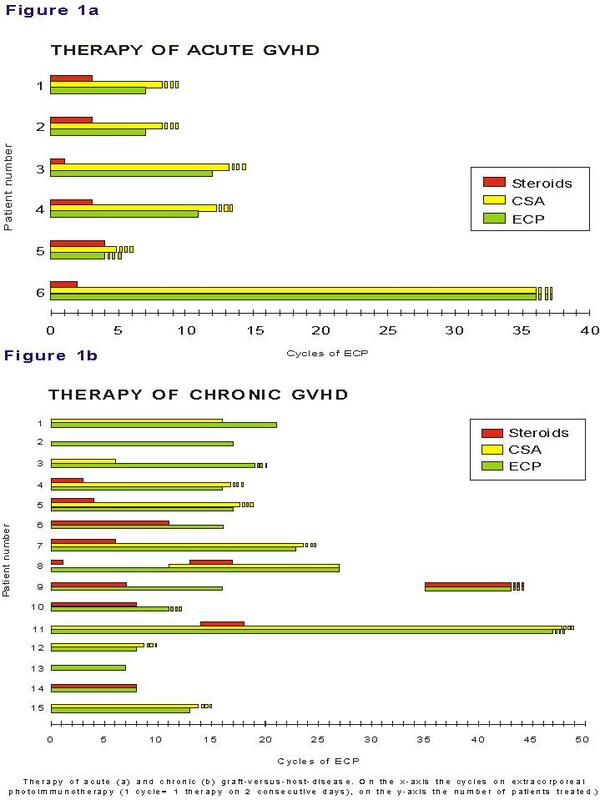 From 1993 on, all consecutive patients with chronic extensive GVHD were treated with ECP and from 1996 on, patients with clinicopathologic diagnosis of acute GVHD resistant to steroid treatment were included. Due to limited capacity at our Institution only a small number of patients with acute GVHD could receive ECR. 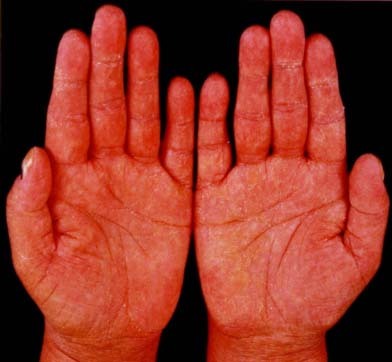 The clinical diagnosis of GVHD was confirmed by histopathology of the skin and clinically graded as 0 through IV for acute GVHD by standard accepted criteria and as "none", "limited", or "extensive" for chronic GVHD. Progressive onset chronic GVHD developed as a direct extension of acute GVHD, and de novo chronic GVHD was not preceeded by acute GVHD. Diagnosis was established upon review of clinical, laboratory, and histologic data. 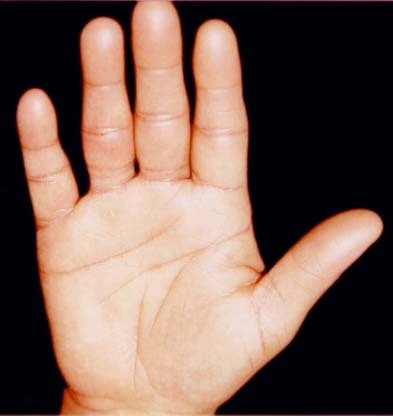 Complete organ responses of chronic GVHD were defined as resolution of skin, joint, oral mucosa, liver or ocular manifestations. Partial responses were defined as a greater than 50% response in organ involvement, but less than complete response. No change was defined as stable organ involvement despite the tapering of other immunosuppressive agents by at least 50% of the dosage. No response referred to progressive worsening of chronic GVHD, and inability to taper other medications. ECP was initiated when the white blood cell count was above 1x109/l. Patients were treated on 2 consecutive days at 2-week intervals for the first 3 months and thereafter every 4 weeks until resolution of GVHD. 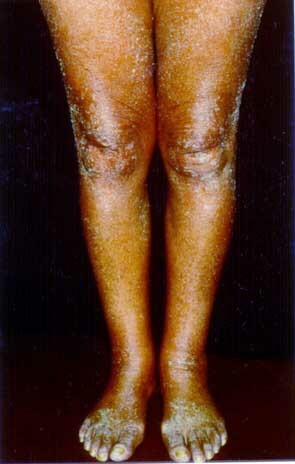 Figure 2: Lichenoid involvement of the palms and legs in patient 6 of figure 1a, prior to and in complete remission after ECP. 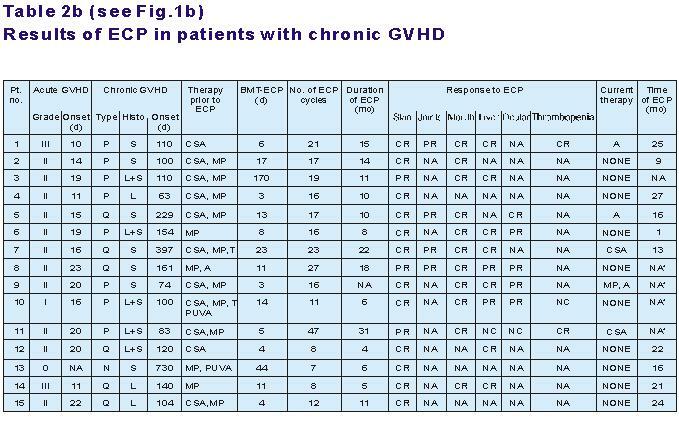 Our report is the first to provide detailed information of the so far largest series of patients given EPC for chronic GVHD. Considering the fact, that only patients with histologically prove extensive chronic GVHD were included in the study and 87% had been given prior systemic immunosuppression without response, our results with ECP appear to be very promising. Skin and oral mucosal affection due to chronic GVHD completely resolved in 80% and 100% of patients, respectively. Even liver involvement resolved completely in 70% of patients. Partial responses were seen in patients with joint involvement or keratoconjunctivitis. Conventional treatment of GVHD which usually includes prolonged and high-dose corticosteroids, may be responsible for severe side effects including Cushing's syndrome, hypertension, renal failure, or life-threatening infections. In our study at initiation of ECP all patients with acute and 8 of 15 patients (53%) with chronic GVHD were on steroids. Once ECP was started, gradual improvement allowed a timely reduction and, finally, discontinuation of steroids without increase in GVHD activity. No deaths due to complications were observed in our patients. Respiratory infections and particularly sinusitis are frequently seen in patients with chronic GVHD resulting from a combination of sicca syndrome in the sinuses and a predisposition to bacterial infections. Reactivation of latent cytomegalovirus infection occurs in approximately 70% of CMVseropositive marrow graft recipients and 30% of CMV-seropositive patients whose donors are seropositive. The use of ECP in our group of patients did not increase the rate of infections compared with results previously published. In fact, our findings confirm reports on patients treated with ECP without increased sensitivity to bacterial or viral infections. Since the risk of central venous catheter-related infection complications has to be considered in immunosuppressed patients, all ECP treatments were performed by additional access through suitable veins in the forearms. In view of the fact that no septicemia occurred in our patients, we recommend this approach for selected future patients. So far, only few patients with acute GVHD treated with ECP without achieving response have been reported. 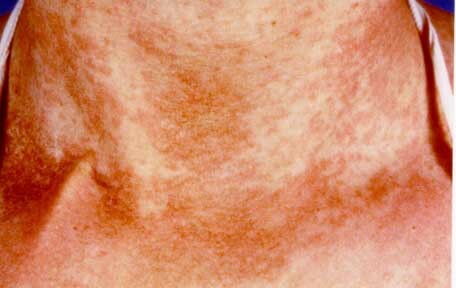 In our study, complete resolution of both skin and liver involvement was seen in four of six patients with sterold resistant acute GVHD. Two additional patients are responding but currently still under ECP. Aside from a reversible decrease in peripheral blood neutrophil counts during the first cycles of ECP when hematologic regeneration after BMT was still incomplete no major side effects were observed in these patients. The fact that in our study ECP was administered over a substantially longer time period as compared to previous reports may explain the response rates achieved in our parents. In summary, our results demonstrate that ECP is a safe and efficacious adjunct therapy for selected patients with both acute and chronic GVHD. However randomized studies are mandatory to evaluate the true impact of extracorporeal photoimmunotherapy on the course of graft-versus-host disease and overall survival. Table 1: No=number; yrs=years; AML=acute myelold leukemia; ALL=acute lymphoblastic leukemia; CML=chronic myelold leukemia; NHL=non-Hodgkin's lymphoma; SAA=severe aplastic anemia; CY=cyclophosphamide-, flbl-fractionated total body irradiation; VPI6=etoposide; GVHD=graftversus-host disease, CSA=cyclosporine A; MTX=methotrexate; Pred=methylprednisolone; BM=bone marrow; serol=serologic-, LBT=Ilgation based typing of class Il. Table 2a: ECP=extracorporeal photochemotherapy; GVHD=graft-versus-host disease; d=days; Max=maximum; BMT=bone marrow transplantation; NO=number; CSA=cyclosporine A; MP=Methylprednisolone; CR=complete remission; PR=partial remission; NA=not applicable; NA*=still under ECP.